I got an e-mail today from TheKnot.com advertising a bunch of different things that are on sale to personalize. I thought this one was the craziest. 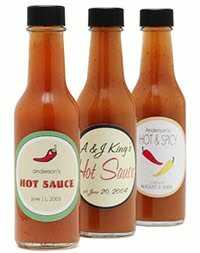 Personalized Hot Sauce. Who thinks of these things? Better yet, who wants to go home with a bottle of hot sauce with someone else's name on it? I'd prefer a candle, thank you.